The idea of going to yoga on Sunday morning didn’t sound appealing to me. It wasn’t raining and Michael suggested we got for a hike. I agreed, we ate eggs, bacon and an English muffin for breakfast and then set out to go hike the same trail we did last weekend (the trail where Bella got injured). 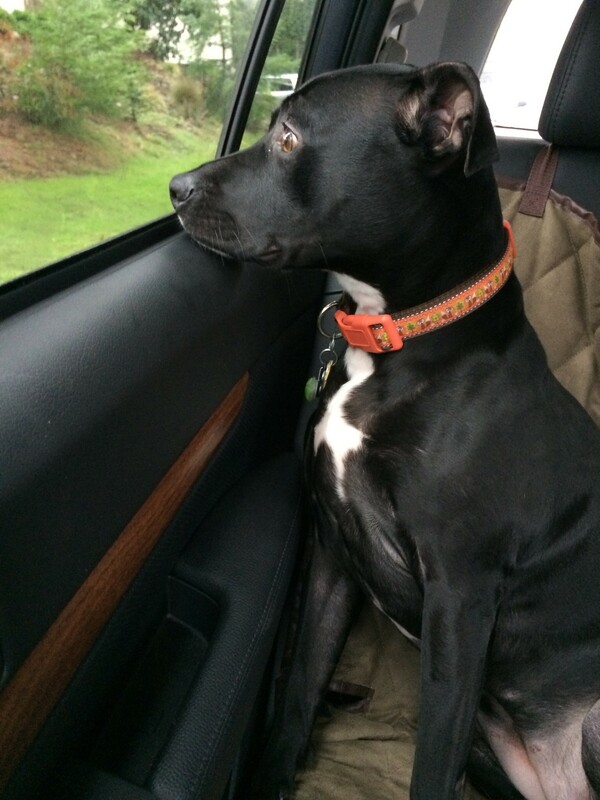 Bella was SUPER EXCITED about going for a hike. It’s funny–the words she freaks out to are “car”, “treat”, and “hike.” We drove out to the industrial area to pick up the trail we did last time. 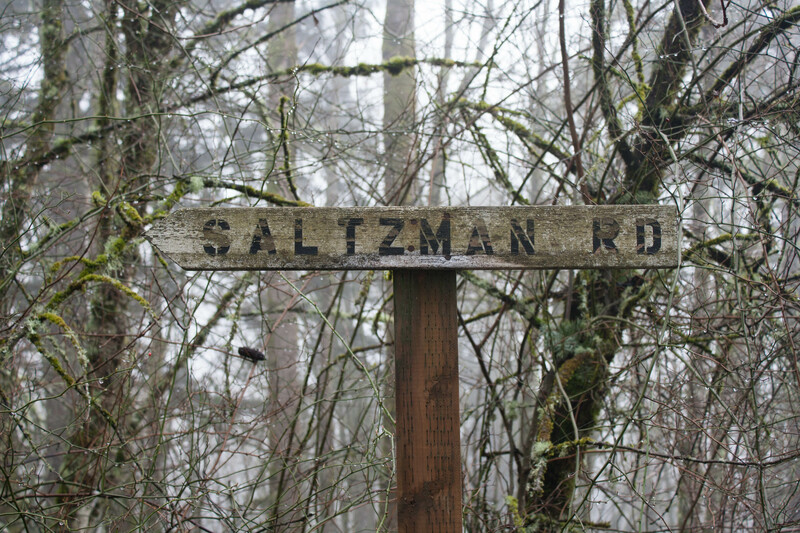 This time instead of doing Maple Trail (too muddy) we stayed on the main path that turned out to be Saltzman Road. 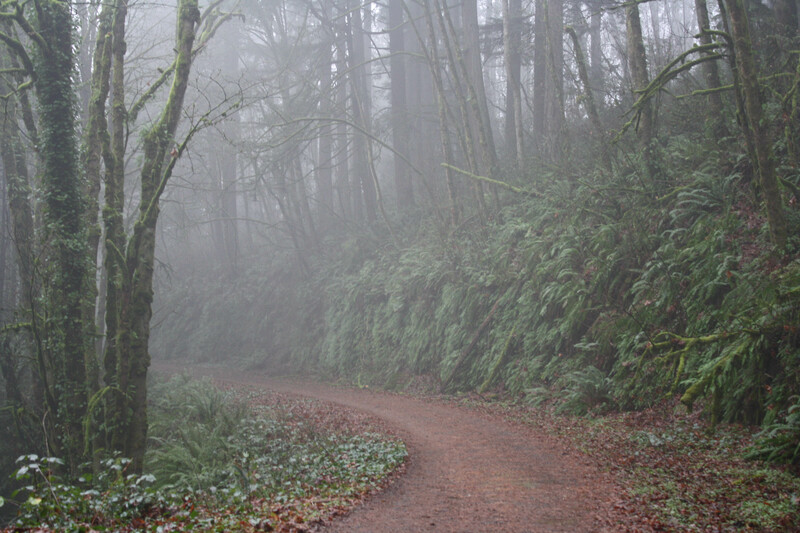 Saltzman Road is the main, wide, road through the forest. 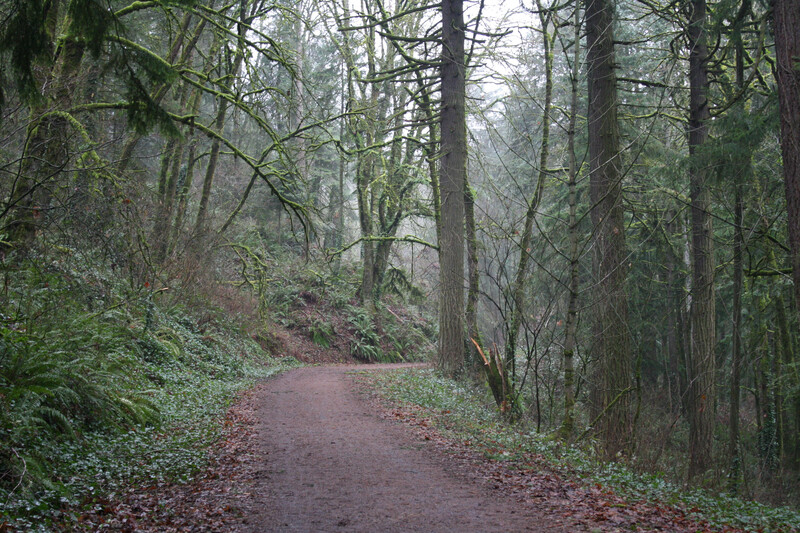 You go uphill about 3/4 mile and that’s where you can pick up Maple Trail (either up or lower trail). We continued around the corner and stayed on the main road. It wasn’t overly crowded but we did see a fair amount of mountain bikers (completely covered head to toe in mud) and trail runners. Most of the hike we were in a cloud of mist. It was kind of spooky. 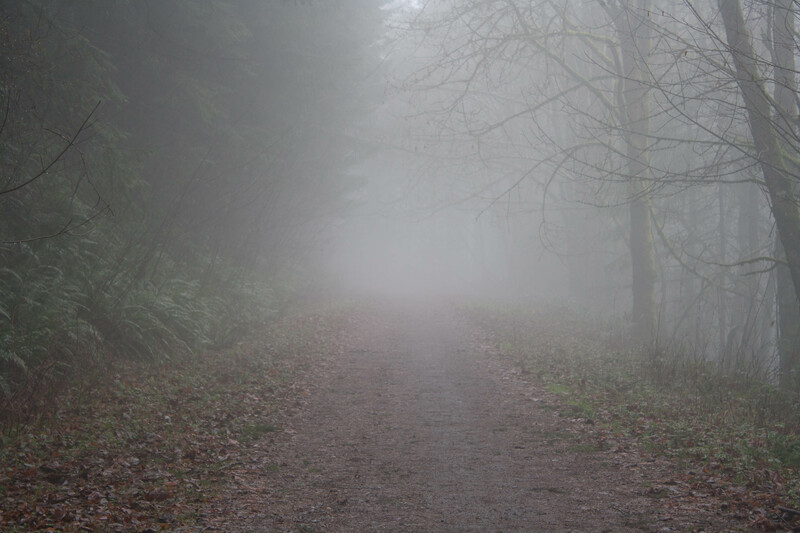 It was foggy, quiet and a little eerie. But at the same time it was kind of peaceful. 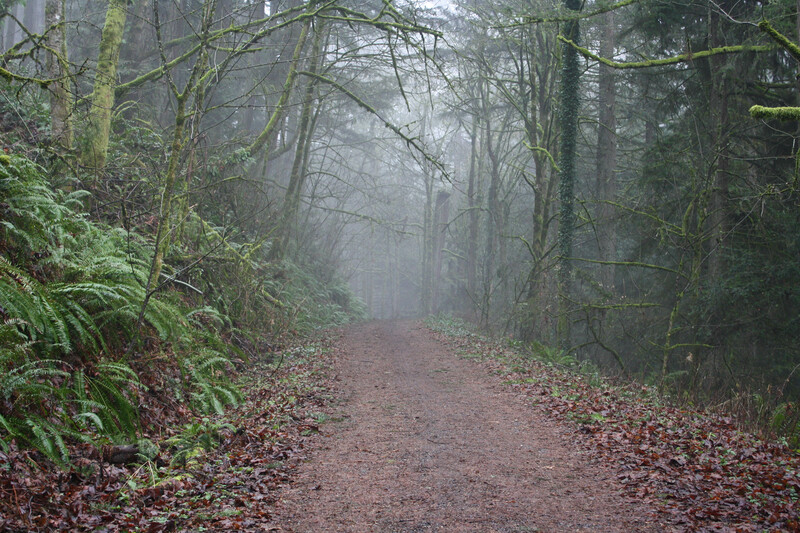 As you can see, the path is pretty wide, which is nice, and it was a mixture of gravel, dirt and some pavement. It was nice that it wasn’t just a giant mud pit like the other trails. 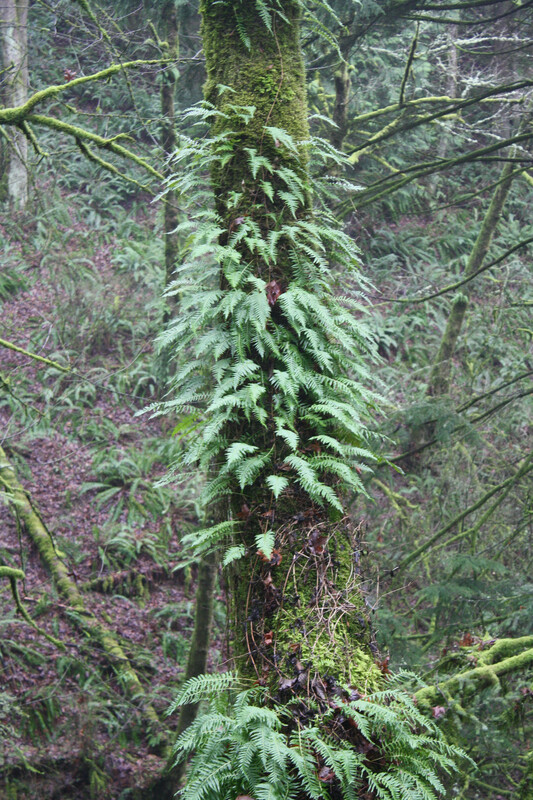 How do the ferns grow OUT of the trees? I really want to know how that works. Fascinating. Bella did great on the trail, didn’t bark at strangers she met on the trail. We also passed the “scene of the crime” from last weekend and thankfully she didn’t notice. 😉 We did have one (well two) minor incidents on the trail. 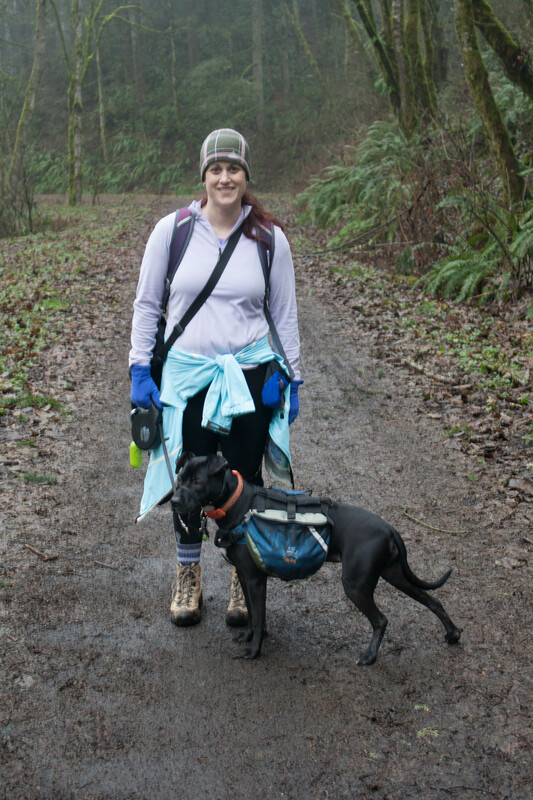 It makes me crazy–people with their dogs off leash! Especially in a major park that clearly has signs everywhere that you have to have your dog on leash AND pick up after them (which people don’t do because we see poo bags on trails all the time–why pick it up and then leave the bag??). Some lady was walking her two dogs off leash and one of them came barreling up the trail when it saw Bella. 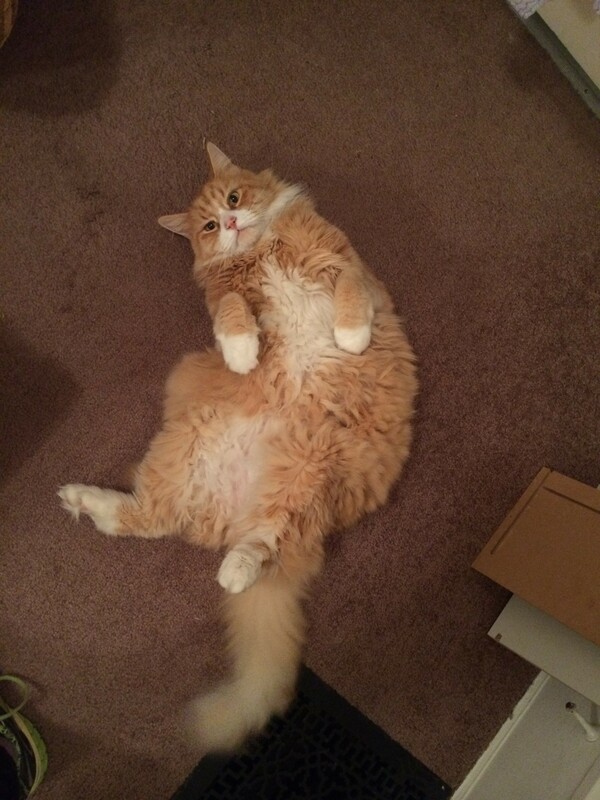 It was CHARGING. GRRRR. 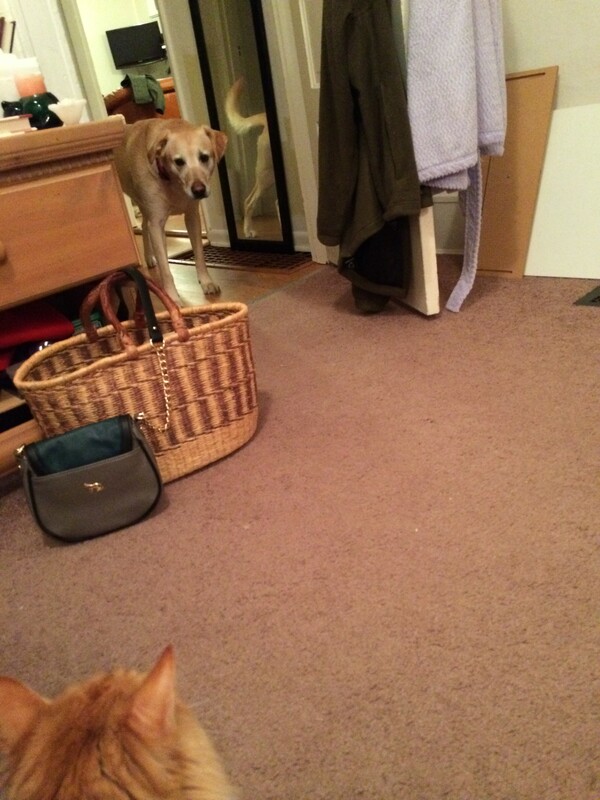 I stepped in front of the dog and told it “NO!” And made sure it didn’t get near Bella. The lady was an idiot. She was like “Oh he’s ok, he’s still a puppy”. Um? What? If it’s a puppy and not trained off leash to stay NEXT TO YOU and not charge other dogs, maybe it needs a leash? Maybe? Common sense? Anyways. I promise I won’t rant about off leash/bad owners too much more. I think it’s because it’s Forest Park. We never had issues like this on such a consistent basis when we hiked elsewhere. I think Forest Park is just really popular and it attracts more people. So we turned around and hiked down. The trail was a gradual hike up, nothing too steep or strenuous but kept my heart rate around the 130 mark, and that helped loosen up my legs. 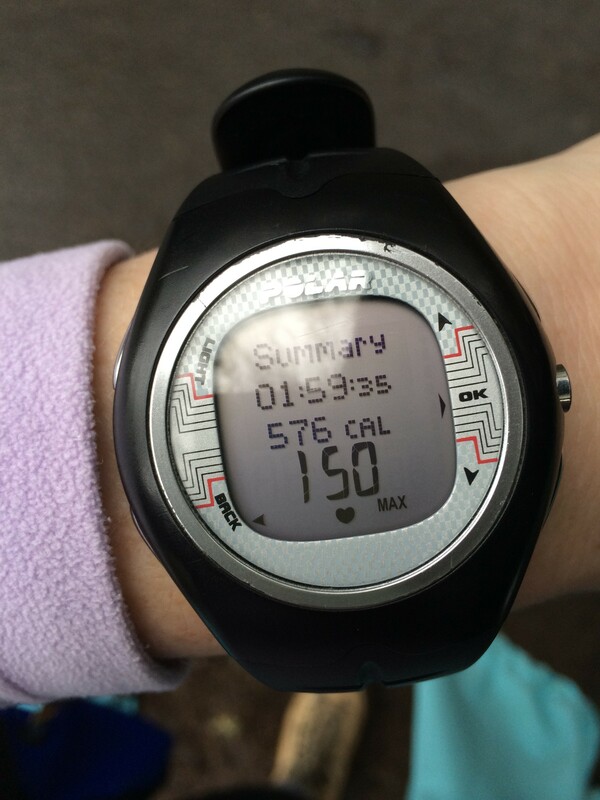 But once we started hiking downhill, I felt my body starting to tighten up and by the end of the hike I was SO SORE. We ended up hiking 5.40 miles in two hours. 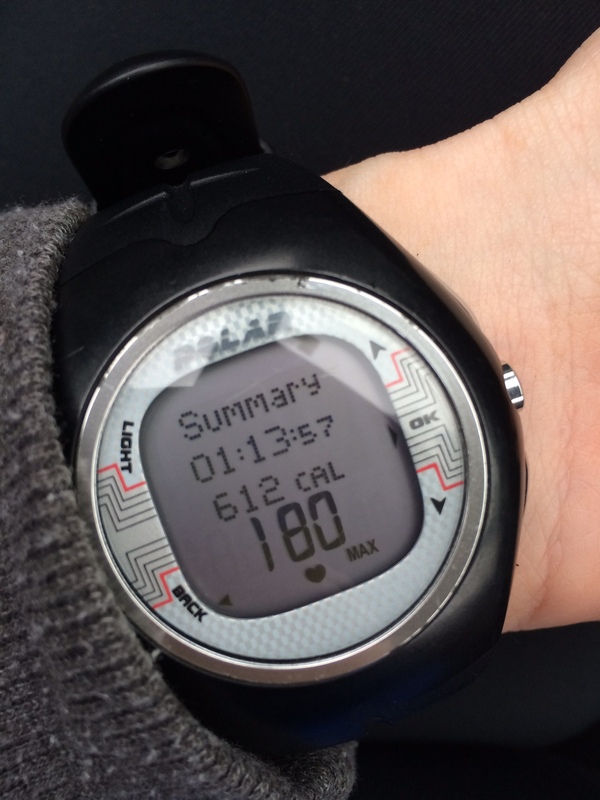 I burned 576 calories. We stopped at Subway on the way home and split a sandwich (I was famished AND freezing). Then Bella got a bath because she was FILTHY. I also got a bath but mine had epsom salts in it to see if it could help my sore legs. After we got cleaned up we went over to my friend Star’s house for dinner. We had to cancel our Christmas dinner plans last months because of illnesses and so we rescheduled to do a belated Christmas-early birthday-housewarming dinner. I hadn’t had the chance to see her new places since I helped her move back in October. I was excited to see the place now that they were all settled in! Whisk olive oil, lemon juice, garlic, cumin, salt, and black pepper together in a bowl until dressing is smooth. Add carrots, chickpeas, parsley, and onion and toss to coat. There were five of us for dinner and we got about 6 servings out of the salad I made. The salad was tasty and light in flavor. Star made an AMAZING dinner (as usual). 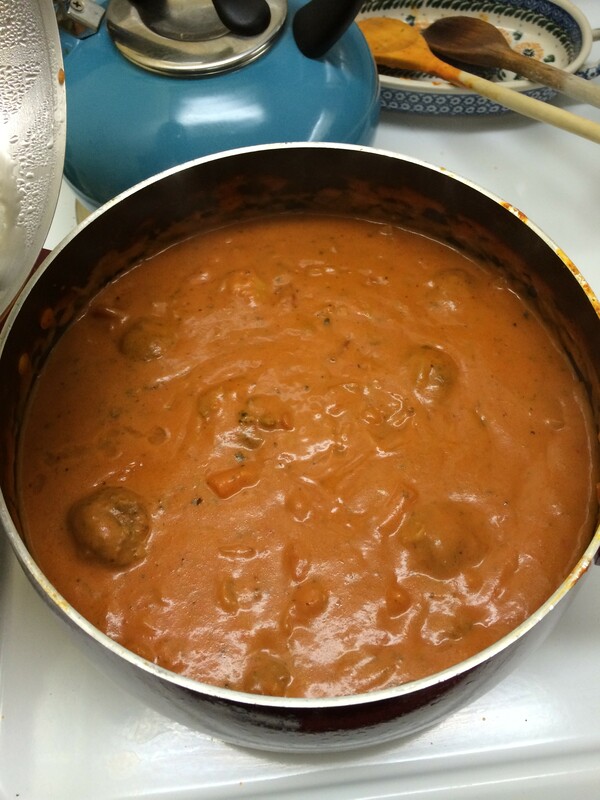 She made spaghetti sauce from scratch (she’s a “throw everything in a pot” kind of chef and it’s always delicious). Words cannot describe how good this spaghetti sauce was. It was so creamy and my guess is that was the alfredo sauce she added…yep it had all the calories I think! She also added a bunch of veggies to the sauce–carrots, celery and I think there were some mushrooms in there. 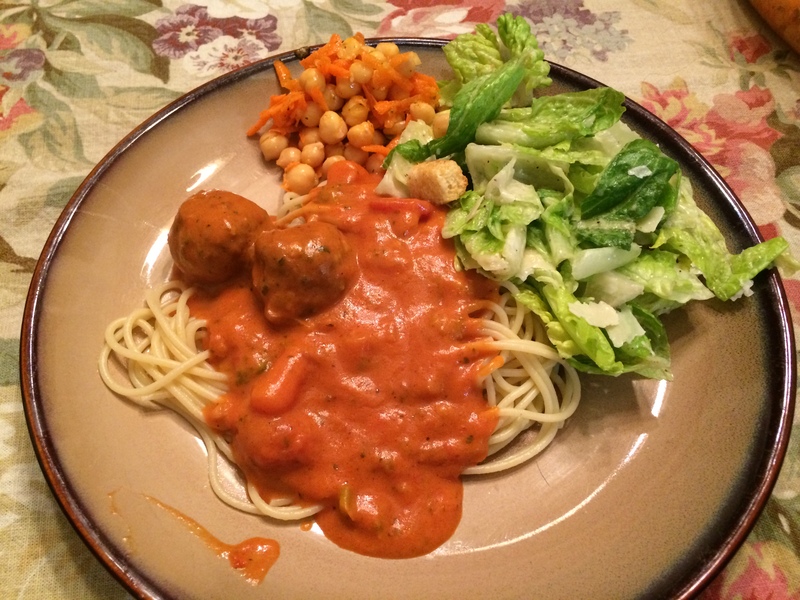 Spaghetti and meatballs in homemade sauce. With a side salad and the salad I brought. Everything tasted great. I brought a bottle of wine as a housewarming gift but I didn’t have any of it (limiting my liquid calories right now). After dinner we had satsuma oranges for dessert and Star opened the Christmas and birthday gifts I brought for her. Then we went in her room and she showed Michael some yoga stretches he could do to help with the things that hurt him (Star teaches yoga). It was a pretty good night. I was tired from the hike and still really sore but it was SO good to spend some time with my friend. I miss living next door to her. 🙂 But at least at her new place she’s much closer than her old place. In a few weeks she is going to give Michael and I a private yoga lesson. I’m looking forward to that to fix some of my form issues and to show Michael how to do some stretches that will help with his back and IT Band issues. I love your hikes, the photos are always so gorgeous. Thanks for sharing your day with us. 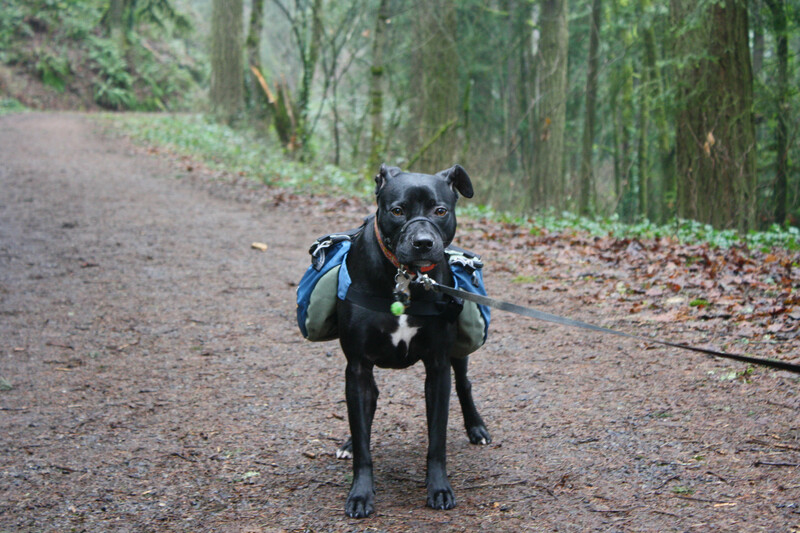 I agree with you, I hike a lot and dogs off the leash always make me nuts. Even if they are friendly, it just makes for an awkward situation. I can count on one hand the off leash dogs we’ve come across that were perfectly behaved. On the flip-side I’ve also seen good owners who had dogs off leash but then put them back on leash when they see us coming up the trail. I really appreciate that. I totally get your rant about dogs not on leashes. It looks like a really nice hike though! It’s frustrating. We worked really hard training Bella to behave on hikes and she is doing great. Then these strange dogs charge us (or attack her) and I want to just scream at the owners! What is wrong with you!?!? People are so inconsiderate. What a great hike! The story about the dog of leash makes me mad too. Worst thing is when people say “he never does that” or in this case ‘he’s still a puppy”. 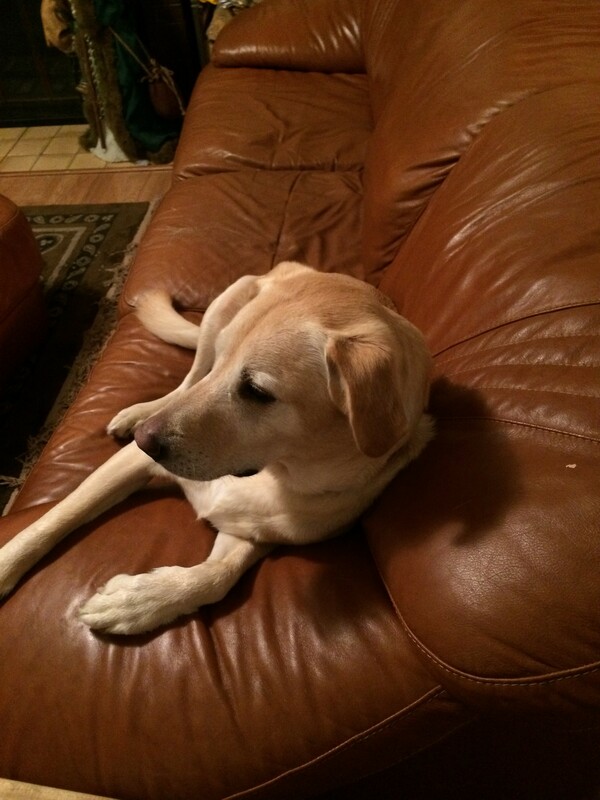 I have our first hike of this year planned next Saturday and will see how it goes with Bella. Hopefully not too many dogs that we will meet. Here also that depends on how popular a forest/trail is for dog owners and since I am going somewhere I’ve never been I just have to see. Meal looks delicious, sounds like a fun night.